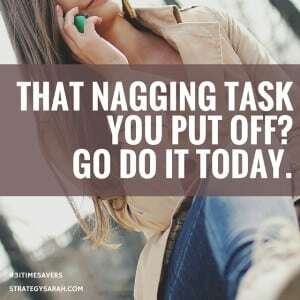 That nagging task you’ve been putting off? Do it today. I put off making the call for months. This is entirely too common a habit of mine, particularly when it comes to phone calls. Can you relate? A year and a half ago, my dental insurance changed and my current dentist was out of network. I cancelled my appointment on the theory that I could find an in-network dentist and save money. I was quickly overwhelmed by the options, and didn’t take action. Eventually, I was embarrassed that I had waited so long, so continued to avoid the issue. I had endless internal, mental excuses. And dread over how bad it was going to be. And knowing that once I made the call, it would be a long wait to get in. I love my dentist, and apparently so do a LOT of other people. I spent months with this weighing over my head. Endless questions, fears, doubts and thoughts looped through my head: Which dentist should I go to? How do I even pick a dentist? I can’t possibly go back to mine. I’m so embarrassed that it’s been so long. My teeth are so horrible. When am I going to find time to make the call? One random September day, my boss was talking loudly in our open office area about needing to go to the dentist. She had also put it off, though not nearly as long as I did. I casually mentioned I hadn’t been in forever either. I made a snap decision to just do it now. After all, if the boss is going to the dentist, that’s an easy way to say I need to take a longer lunch, or come in a bit late for the same thing. I dialed the number so quickly that I didn’t have time for my typical phone call fear to set it. Amazingly, there was an appointment available the next day. What?! Yes, I’ll take it. The fact that the appointment was less than 24 hours later meant that I didn’t have time to build up (too much) dread about the appointment. To my shock, it was a pleasant experience. Nobody said anything about how long it had been since I’d been in, or referenced how horrible my teeth were. It was just like any other dentist appointment. Perfectly neutral once I got up the courage to go. She’s right. 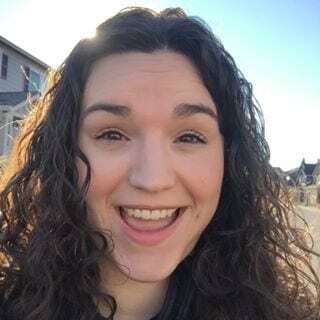 Why was I going to leave the one dentist I’ve ever semi-enjoyed when just the decision-making process for finding a new one meant that I would never actually get around to doing it. Besides, what’s more expensive – spending more on a cleaning, or major mouth issues because I didn’t go to any dentist for years? My phone calls and the dentist are two areas I am prone to procrastination. What about you? Identify an area that you procrastinate in. 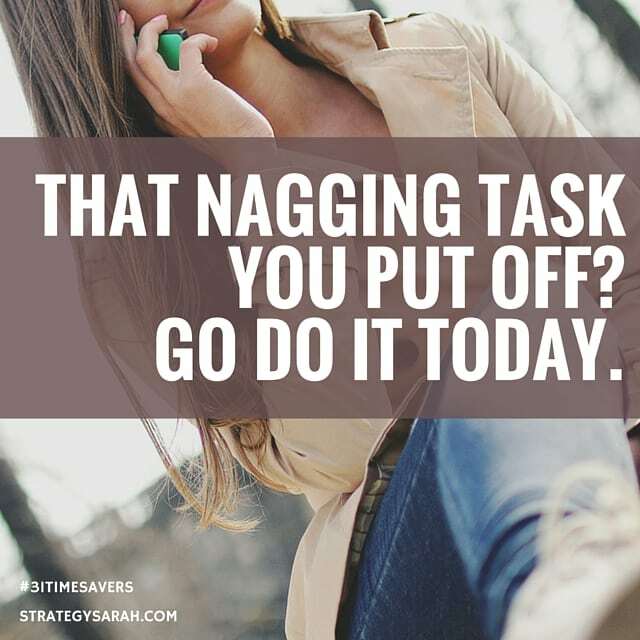 Pick one nagging, lingering to-do. 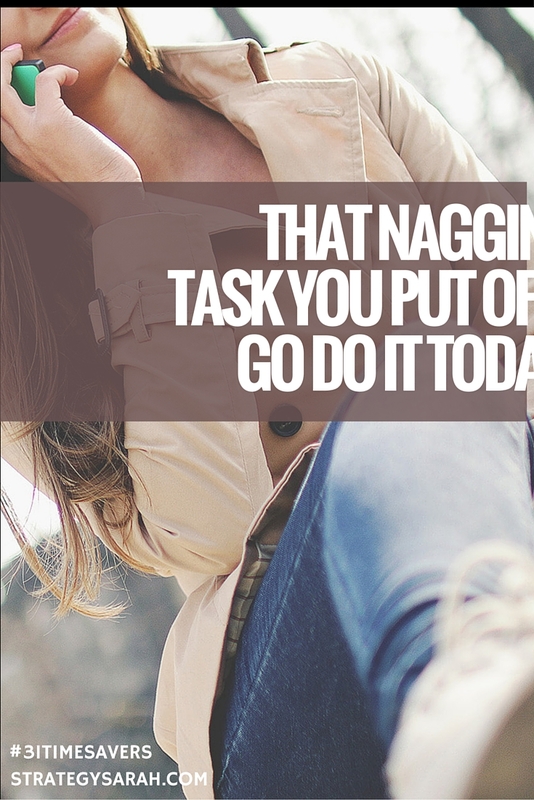 Go do it today! Then let me know how it went.